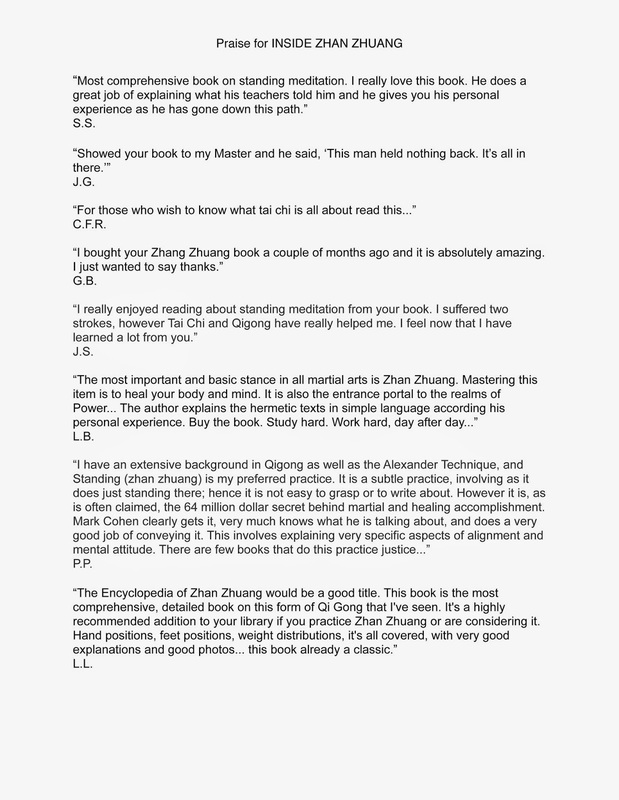 When I envisioned the book, Inside Zhan Zhuang, my primary intention was to help practitioners around the world avoid years of trial and error, and not understanding or knowing what it is that makes Standing Meditation such a powerful tool for the enhancement of health, martial power and expanding awareness. It appears from the many emails I’ve received, that I have succeeded. 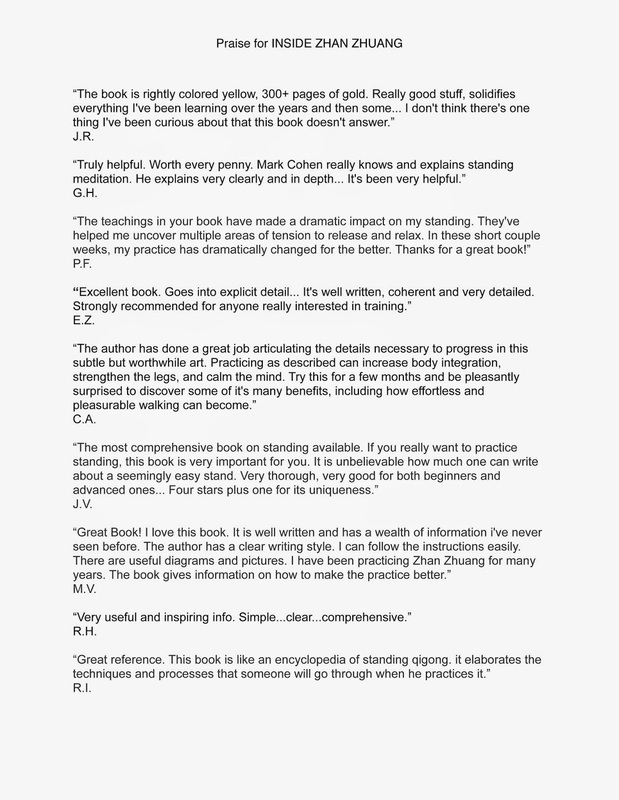 Below are some of the reactions of actual people who have purchased the book. Daily zhan zhuang practice has literally been a life-changing experience and because I have yet to be able to find a teacher where I live in South Australia, Inside Zhan Zhuang has been invaluable. But thanks, from my heart, for a classic. In what part of South Oz due you live? Hi, Mark, G'day from here. Sorry for delay getting back to you. I was happy to express my genuine thanks for Inside Han Zhuang, since it's been such a gift. I'm in a suburb south of Adelaide. So far, I've found one martial arts school that offers a bit of zhan zhuang as a warmup for its classes, but it's the zhan zhuang I want to focus on, not the martial arts. To be honest, I've stopped looking real hard, especially since I began a daily practice and got my copy of Inside. I've got way more out of having a daily practice than I could have imagined possible, and dealing with the effects that it's having...not fallout, because it's overwhelmingly positive...but assimilating the insights, along with just living my life in the light of those insights, is satisfactory for the time being. I don't in any way imagine my form is beyond the need for improvement or think I'm so naturally brilliant at zhan zhuang that I don't need a teacher. And for sure, questions definitely arise from time to time, and it would be nice to have someone I could ask them of (she said wistfully...), and be part of a zhan zhuang community, although so far, with some patience and persistence, I've found most answers in the book. One thing, if you don't mind: Is the Fong Ha in your lineage the Sifu Fong Ha with the website fongha.com? I'd had a peruse of his website and wonder if his book, "Yiquan and the Nature of Energy: The Fine Art of Doing Nothing and Achieving Everything" would be helpful. I'm not hurting financially, but it's been hard to adjust to how expensive books are here compared to when I was living in my home country of the US, and it takes me a while to decide to pop for one without perusing it myself first or unless I get a trustworthy recommendation. I'm happy to answer your questions, but not as public comment. Please contact me at InsideZhanZhuang@gmail.com and use your personal email to send.